← Viagra to the Rescue! he had decided that the number of American military personnel in Pakistan were to be reduced “to the minimum essential“. No pretense here at all about who is running Pakistan. 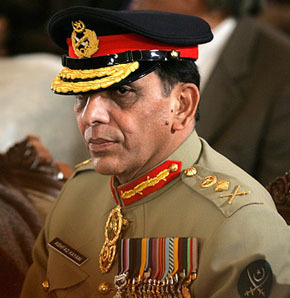 The General decides foreign policy and who stays in Pakistan and who is expelled. At will he contradicts his own Prime Minister, who in a Washington Post article said the Osama raid was a joint effort and that Pakistan had collaborated in its success. This is symptomatic of what is wrong with Pakistan. For 36 of its 63 year existence Pakistan has been ruled directly by its Army Chief. And for the remaining time (as you can glean from Kayani’s blusterous statement) the weak civilian leadership shuts up and listens when the Army Chief directs. Today, Kirin Aziz Chaudhry was reporting on KQED’s Forum that Anti-American sentiment in Pakistan, which is always high, was ”palpable“ in the streets there. Standard modus operandi – a whipped up fever-pitch hysteria against the West (and also India) continues unabated to justify huge expenditures on defense (25% of all government spending) and giving up all rational say in how to build an open, democratic society. 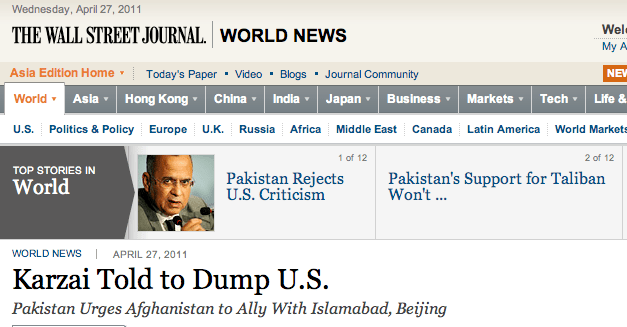 Truth is we are acting out a charade of being allies with Pakistan. Both sides continue this charade because it suits their limited-perspective objectives. Pakistan (read: Pakistani Military) gets its billions which it immediately diverts to lining its brass’ pockets and buying weapons, expanding its nuclear arsenal and the like (while we look away) and we get access to the country for our intelligence and terrorist monitoring/control activities. In important aspects the Pakistani military and its intelligence agency actually hinders this fight against the terrorists – by actively shielding the key leaders and passing on word on the American plans and capabilities to them. This much is obvious to everyone by now and we will have to come up with a way to engage with Pakistan given this reality. It is time for America to re-focus our national interests and principles through a long lens on the global environment of tomorrow. It is time to move beyond a strategy of containment to a strategy of sustainment (sustainability); from an emphasis on power and control to an emphasis on strength and influence; from a defensive posture of exclusion, to a proactive posture of engagement. We must recognize that security means more than defense, and sustaining security requires adaptation and evolution, the leverage of converging interests and interdependencies. To grow we must accept that competitors are not necessarily adversaries, and that a winner does not demand a loser. We must regain our credibility as a leader among peers, a beacon of hope, rather than an island fortress. It is only by balancing our interests with our principles that we can truly hope to sustain our growth as a nation and to restore our credibility as a world leader. At this point I agree with one Pakistani anti-American commentator who said, “You’ve got your man! Now leave.” I think we should. What we would lose would be less than what we would gain by focussing on our core strategic interests.